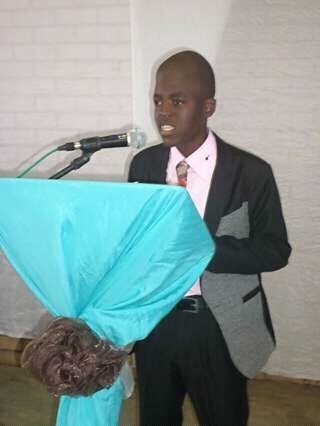 Musa Gift Masombuka is an eighteen year old South African author. He published his first collection at the age of 15, titled Flog A Dead Horse: Poetry Anthology. He got deeper into poetry and has learned a lot about it by reading other poets’ work. Having now been in the ‘industry’ for four years, this time he is back with his third poetry collection MY WORDS IN VOLUMES: Emotions Of A Poet. In this collection he has collaborated with his friend Pule Sanny Shaku, further extending his wings through India working with the very best Indian poets. The other collaborator is a lecture of English Language and Literature at the Chandikol University, Prof. Rajendra K. Padhi. 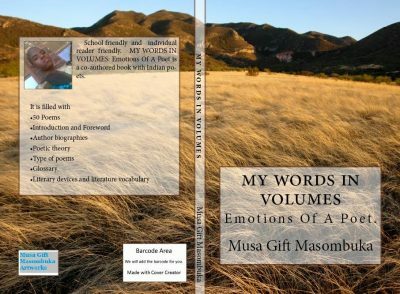 Musa has been working on this poetry collection from November 2015 and has now released it to the public. ‘MY WORDS IN VOLUMES: Emotions Of A Poet‘ is packed with 50 poems that are food for the soul; an eye catching introduction and foreword; poetic theory and glossary. ‘MY WORDS IN VOLUMES: Emotions Of A Poet‘ is in the author’s words ‘the best book he has ever worked on”. This book has poems with a variety of themes for those who console themselves through reading. Despite being from South Africa, none of Musa’s books have been published in his native country. He has always admired working with outside countries, because their services are excellent. He said that not all South African publishers distribute through Amazon which offers a wide range of marketing. 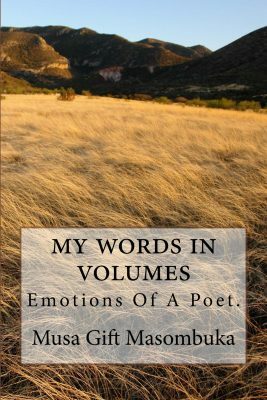 His 2016 book ‘MY WORDS IN VOLUMES: Emotions Of A Poet‘ has been reviewed several times since it has been released and has always come out top; this is what makes him happy. Below is one of the poems from ‘MY WORDS IN VOLUMES: Emotions Of A Poet‘ and a foreword extract. and let our minds extend. and our souls will bond. The rocks will tell you all. and the street lights will film it all. they hold so much of our history. Have you ever felt that the world inside you is building up into a bitter taste? Has life to you seem to be very promising but at the end the ends couldn’t meet? Have you been spiritually abused? Is life starting to become your worst nightmare and the people closer to you seem to be invisible because you are too absorbed in your thoughts? Is your rosy garden filled with thorns, that pricks at you every time happy moments strike? Is life to you becoming more like a daydream dressed like a nightmare, wishing that you could one day wake up and find the storm all over? Are you suffering the emotional torture and life to you has started to be meaningless? How do you feel? Do you have some magic moments you would like to share but do not know how to express them in words? Are you a cupid spreading love to others and want to express it more in a poesy way? Are stuck in a middle of a love struck and would like to get over it? Do you have reminiscent memories that are sheer than the shining moon and beautiful like the night sky full of stars? Life can be wonderful sometimes. Are you still struggling to forgive and forget about the apartheid leap that has drenched the blood of fellow South Africans? Have you travelled and lived in your friend’s souls and would like to express your emotions about what you experienced? Are you a man of nature and has a thing for the animals and creatures? Do you appreciate your life and very thankful for as long as you breathe? Have you seen the struggle of life? Those horrifying moments when everyone has turned the back on you and felt like you are in your own planet of troubles and helplessness? Have you ever sat down and looked at life from a different angle and see things that not everyone could ever see? Has that helped you enough to can confess that you understand life much better? Poetry marks one of the shortest ways to express thoughts and emotions, it has been divided into a wide of ranges where writers express themselves in different emotions and situations. Poets put their pens on the paper to console their emotions and also to send us an important message about their experiences in life, they are our messengers of life. Poets and writers have always been regarded as the titanium towers because their souls are undefeatable for they find healing and rehabilitation in their writings. Writing also serves as a big part of the rehabilitation process. No matter how you feel, this book is designed for you with emotions and moments to share. MY WORDS IN VOLUMES: Emotions Of A Poet has been written for everyone with a troubled soul. It is a book that will help you deal with all your solutions by healing your soul while making you strong. It is again aimed to teach you the important lessons of life and prepares you to all the walks of life. The poems has been carefully selected and well penned for you to get the message while healing your broken soul. ‘MY WORDS IN VOLUMES: Emotions Of A Poet’ can be purchased or downloaded as an e-book via Amazon, here. Born on 1st April 1998, bred in Siyabuswa and grew up at Regae township in Marble Hall, South Africa. First son on his mother’s and last on his father’s side. Published poet at an early age of 15. He is an Arts group leader at his community. A SATMA Awards nominee of 2014. Musa has explored South Africa through his writings, reciting poems and accompanying performing artists of his community.